If you'd like to take advantage of the many things to see and do during your stay at Grand Ridge, in the house you'll find an extensive information pack covering the attractions of the region. See below for a brief overview, with links to further information. Nearby Mossvale Park (Fact Sheet) features English trees, while giant native Mountain Ash can be seen at Mt Worth State Park. 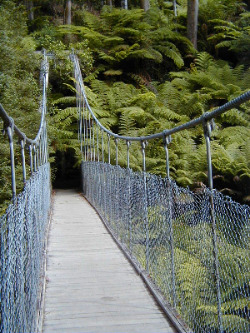 Tarra Bulga National Park has easy walking trails, including a swing bridge, through tree ferns and ancient Beech Myrtle forest. More info (external web site). There are 5 golf courses within 30 minutes of the house. For a coastal experience south of Grand Ridge you'll find Cape Liptrap and Wilson's Promontory National Park, Victoria's most southern land mass. Wilson's Prom offers a variety of challenging walks as well as a few easier tracks. More info (external web site).